I’ll try to answer: Drones from many hives fly to spaces called drone concentration areas, DCAs, where they mate with queen bees in flight. Young queen bees fly to DCAs, usually more distant than ones occupied by drones from her own hive, making it unlikely for queens to mate with genetically similar hive mates. This helps prevent inbreeding, which results in inferior offspring. In the DCAs, drones seek flying queens by sight and pheromones. Drones die in the act of mating; usually more than a dozen mate with a queen. Alexandra questions the drones’ activity outside of their mating flights. Drones conduct no work; they eat honey and rest inside the hive. Workers and queens develop from fertile eggs, and drones develop from infertile eggs in a scheme, common among stinging insects, known as parthenogenesis. When queens make their mating flights, over a day or two, they collect a life-time’s supply of sperm from drones. The queens then self-fertilize each egg that they lay that is to become a worker or queen. If the queen lays an egg without fertilizing, it becomes a drone. Inclement weather can delay mating flights. Long delays result in sterile queens, like the drone-layer shown in today’s photo. Alexandra, an interested reader of The Peace Bee Farmer, writes several questions from her home in Switzerland. Here are some of her questions and my attempts at answering: “Foremost, how can a bee colony survive when humans steal their honey?” Alexandra, this question is at the crux of beekeeping. The bees will starve if the beekeeper robs too much of the colony’s stored honey. We can’t judge how severe a winter will be; so, when harvesting, we have to rely on the shared experience of those who have kept bees in this local area. And, most importantly, we must not be too greedy! Next, “I suppose the quality of honey varies. Does this show?” Honey varies throughout the year, and it varies from year to year. The product that we harvest changes according to the flowers that come into bloom. Different times of the year and different weather conditions will dictate which flowers are available for the bees to forage for nectar to make into honey. Typically, spring and summer flowers produce light-colored honeys with mild fragrance and taste. Honey derived from trees are generally darker in color and more robust in flavor. In the Mid-South of the US, fall honeys are much stronger in flavor and aroma. Alexandra asks how nutrition affects honey bee immune systems. This is a topic of intense study. Honey bee nutrition greatly affects the health of the bees. This topic was discussed by Dr. Dewey Caron at the Arkansas Beekeepers Association’s conference in Little Rock. Dr. Caron explained that optimal nutrition boosts the bees’ immune system and boosts their detoxifying enzymes. 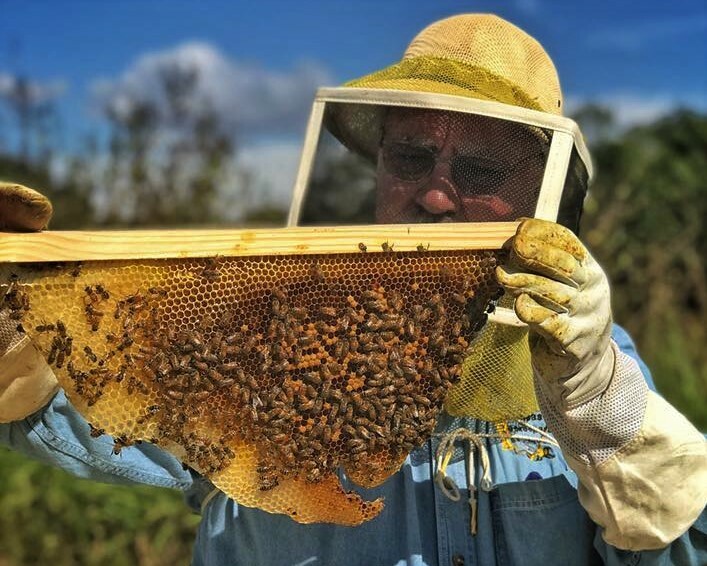 Optimal nutrition often results from the bees having access to a great diversity of flowering plants that bloom throughout the spring, summer, and fall months. One of the ways that we can help the bees and the other native pollinators is to provide plants that bloom throughout the seasons. Today’s photo shows a honey bee foraging a late-season rose in Idaho’s Treasure Valley. One thousand people gathered in Little Rock on a delightful early fall day for the third annual Arkansas Honey Festival. Pleasant weather made for enjoyable events both indoors and out. The event, held at Bemis Honey Bee Farm, featured a full day of classroom, honey house, and bee yard presentations. I was invited to make a classroom presentation on the control of parasitic Varroa mites. I took the group of interested beekeepers into the bee yard where we sampled hives for Varroa mites. We used two methods of sampling, a powdered sugar roll and an alcohol wash. The group noted that the alcohol wash was the more accurate method of determining the bees’ mite load when both methods were used on the same hive. Other presenters described how to properly label honey, how to build bee-friendly gardens, the production of bee hive products other than honey, and marketing of bee hive products. The new Veterinary Feed Directive was described to beekeepers and veterinarians present. In the honey house, eager groups attended sessions on making mead, extracting honey, making creamed honey, and cooking with honey. Bee yard events involved demonstrations on handling bee hive pests and diseases, fall bee hive management, and checks made by the state’s apiary inspectors. I gave a presentation on top bar hive beekeeping. In today’s photo, I demonstrate handling a Kenyan top bar hive brood comb. The Arkansas Honey Festival was an enjoyable social event on top of being an educational opportunity. Beekeepers and folks simply interested in bees enjoyed themselves at the bee farm. Live music played while people shopped with vendors and at the bee equipment store. I dined at the food truck. Children jumped in a bounce house and visited farm animals in a petting area. Some got their faces painted, and many enjoyed riding about the farm on a tractor-pulled hay wagon. The people’s choice honey show allowed the public to taste honey entries from diverse nectar sources from throughout the state.